I don’t live far from the eclipse’s Path of Totality, but I decided to stay put just the same. I didn’t even order eclipse glasses. I know there will be plenty of great video to watch throughout the day, and since my sweetheart is a talented professional videographer, I feel like I’ve got that angle covered. I want to focus on what’s going on down under, here on Earth. In anticipation, I’ve been reading stories about how the event will impact wildlife. 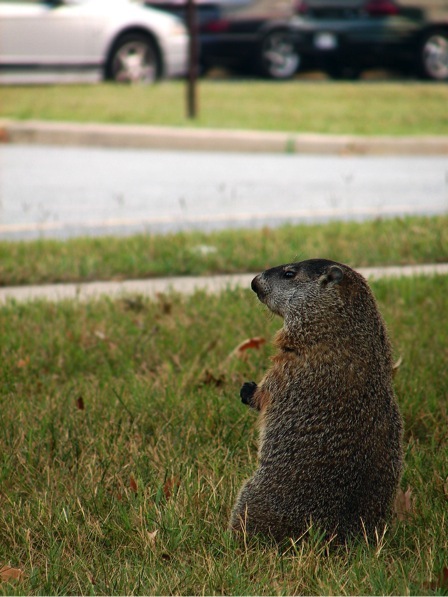 Every single one of these reports has focused on the “strange” animal behavior we can expect to witness as the day goes dark… and I find that very strange indeed. What these experts are calling odd is considered completely normal activity when it happens each evening. And from the descriptions I’ve read about what to expect, assuming night is nigh would be a perfectly reasonable assumption for any creature—human or non-human—who doesn’t have a television or an Internet connection and, therefore, doesn’t know that the sun will be playing hide-and-seek with the moon for a little while today. Humans tend to be less familiar with nocturnal species than the ones who are active during regular business hours. I think the eclipse is going to offer a chance to get to know our neighbors who work the night shift… kind of like a rerun of the National Night Out that took place earlier this month. 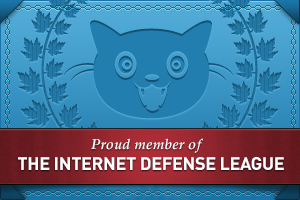 …others will congregate for mutual protection, as they do at the end of every day. Birds who love the night life will wake, possibly feeling less than rested but still ready to boogie in search of an early breakfast (or late dinner, depending how you look at it). Insect musicians will surely want to set the mood with a tune or two. …and amphibians aren’t about to let the invertebrates steal the limelight! As the skies brighten we’re also likely to have a second dawn chorus… but without needing to get up before sunrise! So don’t despair just because the eclipse will pass your part of North America by, or because you don’t know how to make and use a pin-hole camera (even after you Google’d instructions). 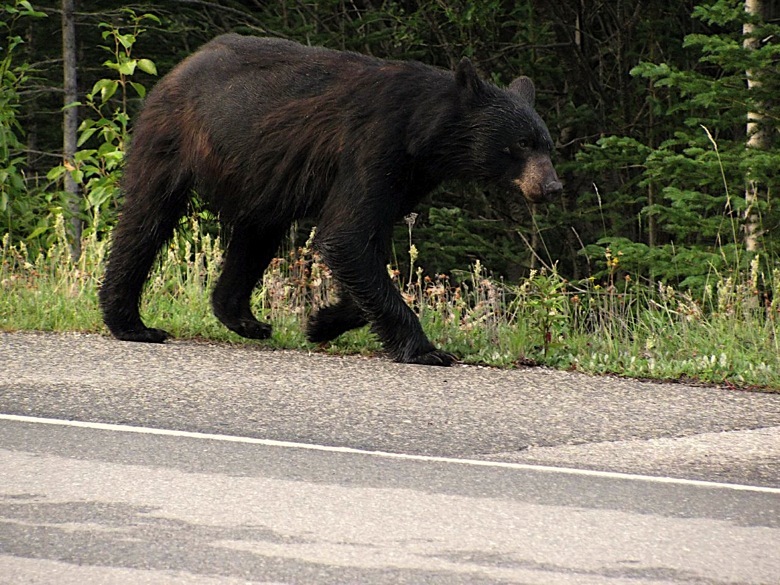 There should be some amazing wildlife sights to see, right here on good ol’ terra firma. I found a blue jay feather this morning while I was out walking my dog, Dash. That isn’t remarkable — jays are a common species here, and because the color blue is relatively scarce in the natural environment (except for the sky) it’s eye-catching. I’ve started an informal collection, compiled on some shelves near my front door. I admire them on a semi-regular basis while running a Swiffer™ over household surfaces, and when I have to pick them up off of the floor because I’m cleaning like it’s a timed event. As I ambled along, spinning the feather between my thumb and forefinger, I could feel it lift at the slightest breeze, attempting to return to the sky. I started thinking about the versatility of this keratin assemblage, this trinket both delicate and durable, this multi-tasker extraordinaire. I’m well aware that researchers say multi-tasking is a myth, at least when it comes to the human brain. We only think we’re doing several things at once, the scientists tell us; actually, we’re just toggling back and forth from one thing to another, which reduces our mental efficiency and even lowers (temporarily) our IQ. I’m mostly convinced by these studies but, full disclosure, neuroscience isn’t my field so I’m only familiar with what’s summarized and reported by the media… and by “media” I mean NPR. In light of all that has been reported, though, I find it even more fascinating and frustrating that handling more than one task is trivial for so many other, less admired, anatomical features. Wouldn’t you expect our much-lauded gray matter to be every bit as masterful at multi-tasking as, say, a feather? First of all, feathers allow birds to fly — a feat humans have still not managed to accomplish, even though we reassure each other constantly that we have the largest, most amazingly intelligent brains on Earth (clearly, though, ours is not the most self-confident computer on the planet). Now, before you think I’ve somehow overlooked the fact that thousands of human beings are flying from one global location to another all day, every day, and have been doing so for quite some time, let me interject that human beings have, without question, figured out how to make machines fly (with the aid of metallurgy and fossil fuels, of course). But we have never, not once, jumped up from the ground or launched from a tree branch to flap off into the wild blue yonder. Superman doesn’t count because he isn’t human, and wing-suits don’t count either because that’s gliding, not flying. Humans ride, birds fly, and they do it by flapping feather-covered arms, using renewable energy sources like insects, berries, seeds, and sugar water. Next, consider that feathers also provide thermal insulation. This should come as no surprise because people use bird feathers to keep warm, too. We stuff clouds of down and feathers in-between layers of rip-stop polyester made from recycled plastic water bottles to manufacture vests and parkas. Then we slip on the garment, zip up the front, and head out into the elements to do some birdwatching. Birds can waterproof their feathers with bio-oils stored in a convenient uropygial/preen gland at the base of their tail. This is handy because, having allocated their arms to flying, they can’t hold a spray can of Scotchgard™. Nor are they able to use hammers, saws, and other tools to build a roof overhead that will shield them from rain, sleet, and snow, or to build a boat when they want to go fishing. But wait— there’s more! Bet you didn’t know that feathers are also an effective communication device. See, humans use an broad assortment of products, including designer label clothing, team-sponsored gear, our vehicles, digital devices, and jewelry to make nonverbal announcements about our group affiliations and availability. Birds accomplish the same thing using their birthday feather-suits. The colors and patterns they wear say more than any Tinder profile or list of Who’s Who ever could. Female birds assess a suitor’s sartorial presentation to determine if he’s her type, and male birds parade their plumage to show the ladies they’ve got the goods to be a quality life-partner. Or maybe just a handsome hookup, depending on how the species swings. Those same feathers can be used to warn a trespasser that this territory has been claimed, or warn a romantic competitor to back off. Kind of puts the old uni-tasking cerebral cortex to shame, don’t you think? And all this time I’ve been under the impression that “featherhead” was an insult. Ever wonder why hens’ teeth (and any other kind of avian teeth for that matter) are rare? It’s because teeth are heavy. That’s a problem if you live life on the wing but can’t use a knife and fork to cut your meals up into easy-to-swallow morsels. A bird’s beak (aka bill) is an adaptation to flight that serves most of the same functions choppers handle in Earth-bound creatures, but without the high metabolic cost of carrying around a set of pearly whites. Figure A. Beak shape and size offers a clue as to what the owner likes to eat. The beak is a sheath of tough skin on the upper and lower mandibles. 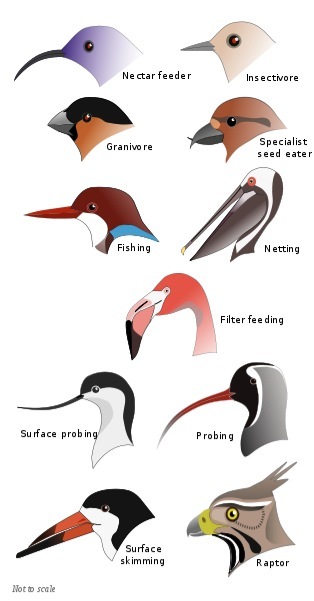 Wild birds exploit a wide array of feeding resources and niches, and they are aided in this task by a startling diversity of beak morphology (see Figure A). For example, nectarivores (nectar-eaters), including hummingbirds, usually have long, straw-like beaks that reach deep into flowers. Insectivores (insect-eaters) tend to have narrow, slightly curved beaks that can reach into the small crevices where their prey try to stay out of sight. Piscivores (fish-eaters) have a sharp hook, serrated edges, or both, that help them hold on to their slippery supper. Some of the most distinctive beaks, though, belong to nutcrackers. 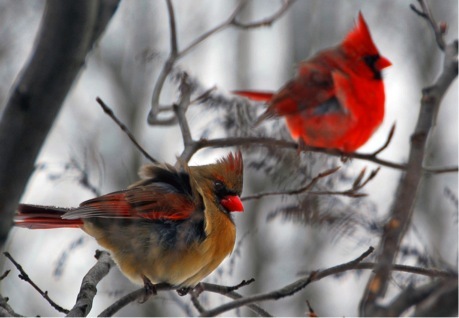 The northern cardinal (Cardinalis cardinalis) is a familiar and popular resident of cities and suburbs, possibly because it’s so easy to spot and identify. 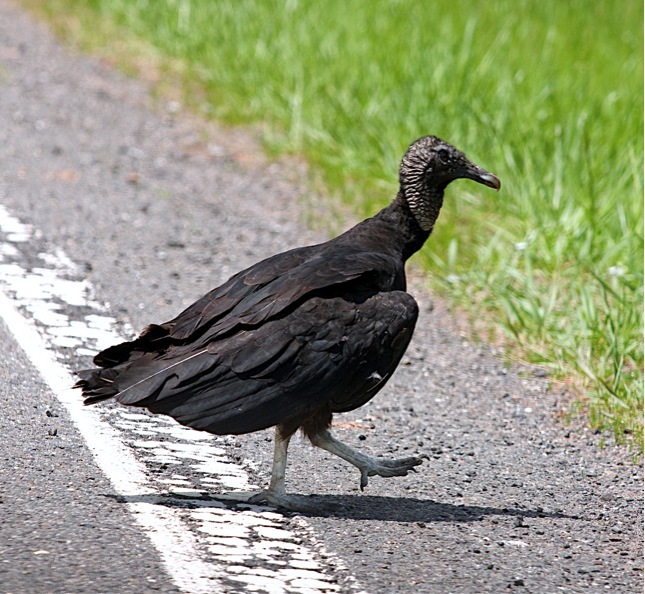 It’s so popular, in fact, that seven U.S. state legislatures have chosen this species to be their avian poster child. At 8½—9” (21—23 cm) from jaunty crest to tail tip, it’s a medium-sized songbird with a stereotypic nut- and seed-busting beak—short, stout, and cone-shaped. Cardinal beaks can crush more than seeds, as I can personally attest. From time to time a cardinal would find its way, with the help of a kindly Samaritan, to the Houston wildlife rehabilitation center where I used to work. When this happened, I would stand at the intake desk, teeth clenched, trying to muster enough courage to open the shoebox in my hands. Now, I like cardinals as much as the next person—I’m from St. Louis, after all, where you can walk down any street in the whole town and know you’ll see someone wearing a shirt adorned with a bright crimson bird perched on a baseball bat. You’d think that would make me an insider of sorts, an honorary member of the family who’s entitled to a few special perks. Hardly. Every time I’ve held a cardinal in my hand, no matter how gentle the exam or treatment, I was rewarded for my efforts with a throbbing blood blister on my palm, administered by a tiny but furious red vice-grip. Who would have guessed you could feel empathy for a sunflower seed? The rose-breasted grosbeak (Pheucticus ludovicianus) is slightly smaller (7—7½” or 18—21 cm) with a pale, conical bill reminiscent of the cardinal’s, only more zaftig… a chestnut to the redbird’s hazelnut. 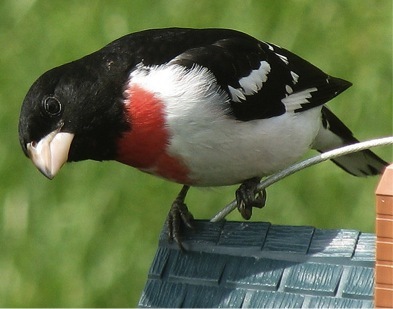 Of course, it’s natural for kin to resemble one another, and the RBG is, in fact, one of 17 species known as the “cardinal-grosbeaks.”* Grosbeak—from the French grosbec (gros thick + bec beak) is a bit of a misnomer for this striking black and white bird with a cherry cravat (the females prefer a more sedate, sparrow-like wardrobe). Compared to the schnozzes sported by some members of the Cardinalidae clan, the RBG has a proud but modest snoot. 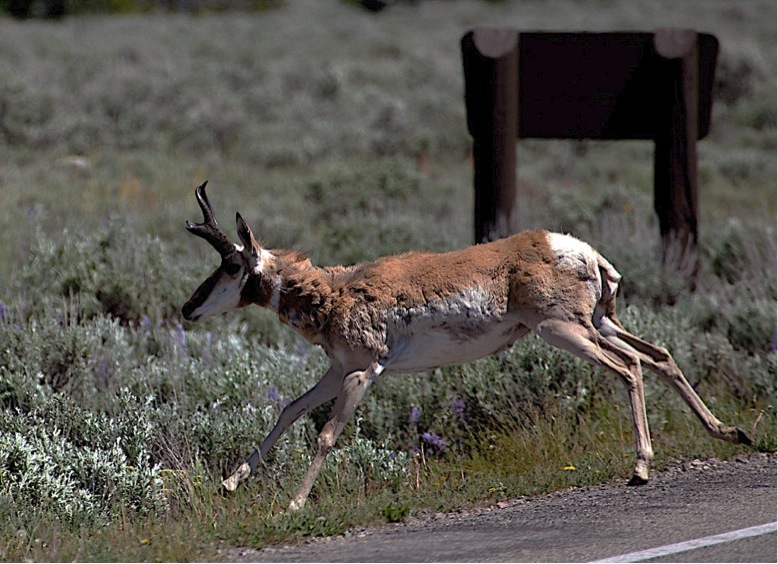 Although not as common as its stop-light colored cousin, human development—and the fire suppression policies that accompany it—have caused forests to sprout where once only grasses grew, allowing the RBG to expand its breeding and migration range westward (although the Rocky Mountains have proven to be a tough nut to crack). They’ve become a more frequent visitor to backyard bird bistros, where they like to snack on safflower, cracked corn, and black-striped sunflower seed. Insects and fruit are part of their diet as well, but seeds account for the majority of their calorie intake, especially during winter months. 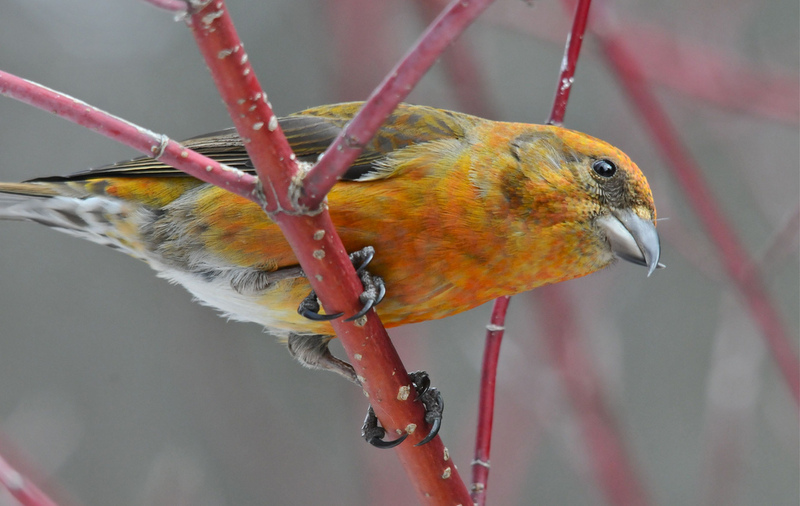 The beak says it all—red crossbills (Loxia curvirostra) are true specialists. At first glance you might think this is a bird in dire need of an orthodontist, but that oddly shaped bill allows them to force open conifer cones and extract the tasty nuts inside. The muscles that allow birds to bite down are stronger than the ones used to open their beaks. But unlike cardinals and grosbeaks, who can clamp down with great force on tough-hulled sunflower seeds (and tender wildlife rehabilitator hands), the crossbill can wedge the slightly opened tips of its bill between the scales of a tightly closed pinecone and then bite down, pushing the scale up to expose the kernel. The red crossbill is extremely dependent on conifer seeds—wildlife biologists refer to animals whose very existence depends on a narrowly-defined habitat or food sources as an obligate species. Most granivores (seed-eaters) start their lives eating protein-rich insects, making a dietary change when they reach adulthood, but crossbills feed on seeds from cradle to grave. 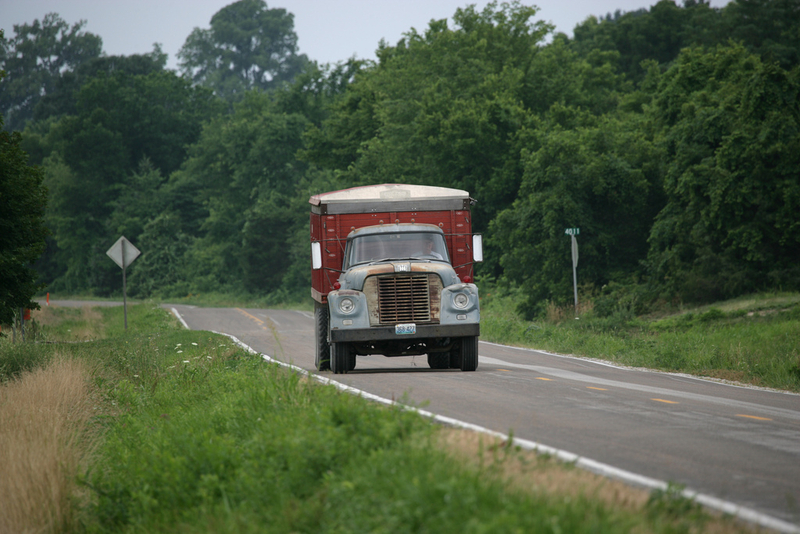 Of course, there are risks associated with being a specialist… we’ve all been warned against “putting all your eggs in one basket.” But as long as long as you follow the advice of Mark Twain and “watch that basket!” there are benefits as well. For example, red crossbills can raise young any time of the year—even during winter—as long as the cone crop is abundant. I guess some nutty looking adaptations are really quite shrewd. 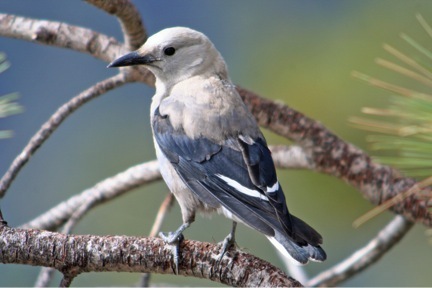 The Clark’s nutcracker (Nucifraga columbiana) uses the same reliable food resource—conifer nuts—to expand its breeding season. But this member of the Corvidae family (jays and crows) takes the idea even further. It is a hoarder, storing surplus pine, spruce, and hazelnuts. They actually have a special pouch under their tongues to carry seeds over long distances. A single Clark’s can hide as many as 300,000 pine nuts over the course of a year, and they use this cache crop to feed themselves and their nestlings. Research has shown they have a phenomenal memory and can find most of the seeds they’ve stashed, even months later. Most… but not all; some of the hidden seeds germinate, re-establishing the bird’s favorite trees in areas cleared by fires or logging operations. It’s a sustainable harvest practice, however accidental, and a form of basket-watching that would make Samuel Clemens proud. * The grosbeak taxa is a conglomerate of distantly related songbirds known as a polyphyletic (“of many races”) group that we’ll explore in greater detail in future NDN posts. © 2011 Next-Door Nature—no reprints without written permission from the author. Thanks to the following photographers for making their work available for use through a Creative Commons license: ehpien (northern cardinal); Conrad Kulper (rose-breasted grosbeak); Eugene Beckes (red crossbill); Steve Wall (male and female cardinals); Trisha Shears (2nd red-breasted grosbeak); Eugene Beckes (2nd red crossbill);and Jamie Chavez (Clark’s nutcracker). Figure A was made available through WikiMedia by Shyamal and Jeff Dahl. Bird song mp3s files are in the public domain.